I made this on EU forums about month ago. Then i realized i didnt post it here, and then i thought i really should do that. Get ready to worship our master ho ho ho! From very early days of my WoT time, i always wanted to play a giant box with hilarous and derpy looks with huge derp gun. Sadly, exactly such thing didnt exist in WoT. (and while E100 was closest such thing, its grind didnt seem interesting for me and i knew it would need some gold to use it effectively...which i didnt want to. Although i now want E100 aswell). Then Japanese heavies happened. O-Ho is just one of many of them. Its not super fast like O-I Exp, it doesnt oneshot everything like O-I, nor is a top tier godzilla like Type 5 Heavy is. That is why, O-Ho, midtier tank was somewhat overlooked for me. Especially when i honestly didnt like tier 8 at all which is infested so much with IS-3s and the fact they often see tier 10s. Anyway, lets got into review itself. O-Ho is tier 8 heavy tank of Japanese heavy tank line. 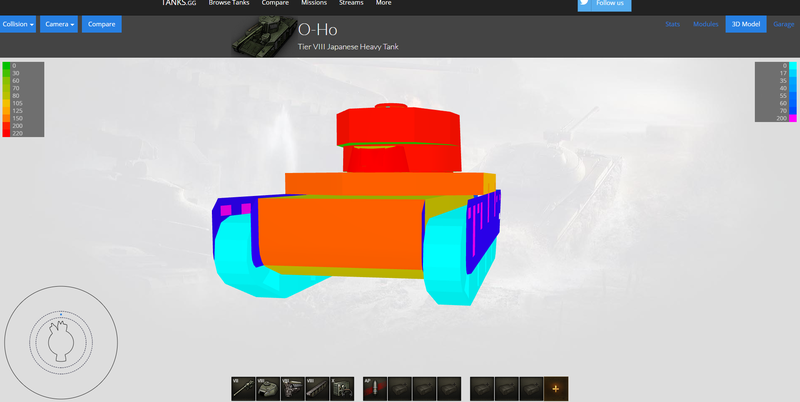 It is still 2nd newest tank line in the game, so if you have been away from the game for some time, O-Ho might be still an odd face for you. Why it stands out from other Japanese heavy tanks and other tier 8s? Why for me it is like Comet is for Quickybaby? Lets start with pros and cons. - Choice of two guns. - Impressive armor: 2nd best frontal armor of all tier 8 heavies (with only super rare M6A2E1 having overall little better effective armor, although it does have small cupola as weakspot). - Impressive HP pool. 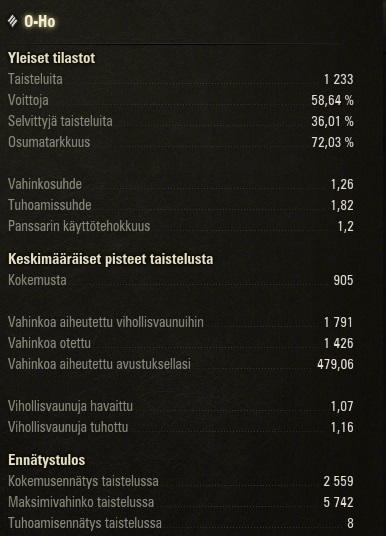 HP is 2nd best in its tier at 1700 (tied with KV-4), with only KV-5 being higher at 1780. - Decent view range. 380 can somewhat negate camo problem when it comes to vision game. Since you have notable view range advantage you might be able to outspot an IS-3. - Great gun depression at -10...when gun is not above miniturrets. - Heavy mass allows it to ram and push wrecks around. - Huge size can be actually useful too: your wreck is very good cover for your allies, and combined with heavy weight, it is very effective roadblock. - Gun is located extremely high, which means you can shoot over almost any ally and some tall rocks/buildings which most other tanks wouldnt be able to, giving enemies potential surprise value. - Both guns have pretty damn good rate of fire. The 10cm gun has highest DPM of all tier 8 heavies ( i think), while 150mm's 14 sec reload doesnt sound that fast at first, you have to consider that O-I gets same gun but with 8 – 9 seconds worse reload. - While both guns has low dispersion and long aim time, their dispersion move and turning turret is actually low, which mean that O-Ho can snapshot very well on short distances. - Ability to mount Vstabs. Only other tank with 150mm derp gun that can mount Vstabs is T49. - Since gold ammo is borderline useless on derp gun 95% of time and 10cm doesnt even have it, O-Ho's survivability is high, and ammo cost is low, the tank is surprisingly effective credit maker. 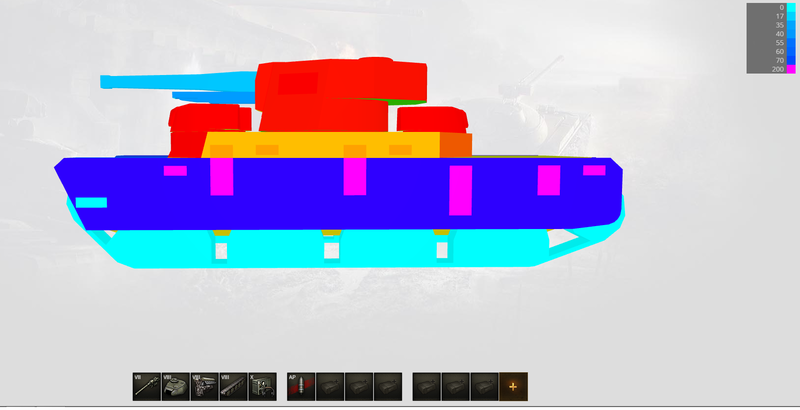 - Thick roof armor can help against arty a little bit. - Can mount super heavy spall liner. - Super easy stock grind since it doesnt have alternate turret and engines, radios and 150mm derp can be researched from earlier tanks. - Its (although unhistorical) name is pretty funny. It does kinda resemble Santa's infamous ”o ho ho” shout. - Mobility. Most obvious flaw is mobility. O-Ho is pretty slow. It has worst top speed of tier 8 heavies, and only KV-4 loses on agility. Its not however that terrible given how massive the tank is. - Gun depression. In my opinion, the biggest weakness of O-Ho. While the gun depression IS -10 degrees, it also has areas...where gun depression is only -1!!!! What is even worse that the gun is located very high, which means that hitting facehugging tanks can be really annoying. We will get more into gun depression in the playstyle. - Huge size. While its pretty great advantage, it is also huge disadvantage. Obviously O-Ho's camo rating is absolutely terrible (for starters, Maus laughs at its camo). 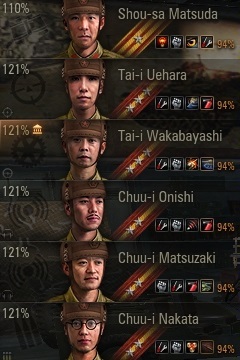 Funnily enough, it is actually best of all Japanese heavies after tier 3, 4 and 5. Still terrible. Huge size also mades it hard to hide behind cover, and it also makes O-Ho very vulnerable to arty. Small tanks can sneak into your sides and avoid your gun, and thus safely feasting on you. - Flat armor. Armor is pretty flat, making O-Ho vulnerable to high-pen guns and some gold ammo. 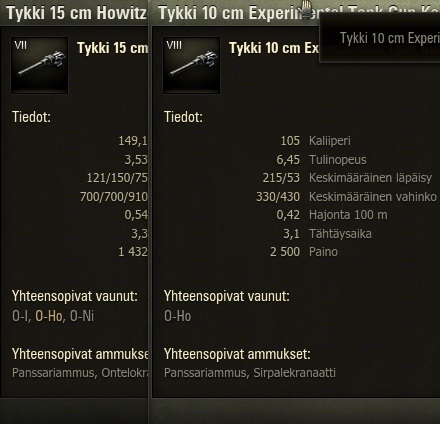 When O-Ho fights guns with more than 230mm pen, its armor starts to struggle to bounce shells reliably, although troll bounces can still happens even against tier 10 guns. - O-Ho's gold ammo is pretty useless on derp gun and it doesnt even have one on 10cm gun. - Low accuracy on both guns. 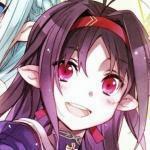 - Suffers from module damage. Ammorack is rather large so it gets damaged often (although it itself is very tough so it needs very hard hit to blow up), radiomen dies often and gunner is kinda vulnerable too. Fueltanks are often damaged by arty shots, so i recommend carrying fire extinguisher unless your crew is very good. - Weak side armor. Tougher than O-I Exp, O-I and O-Ni, but still weak. - Has hullcheeks which can limit sidescraping abilities a little bit, although not as much as on Type 4/5 or O-Ni. - Gets less oneshots than O-I or KV-2 with derp gun. Like i mentioned earlier, O-Ho gets choice of two guns. Or actually, three guns, but the first one is the 10cm gun, which was stock gun on O-I... Yeah, it wont be useful on O-Ho so lets just ignore it. And this is the problem with the it. 215 mm pen is not amazing, and when it is forced to fought against tier 9 and 10 heavies...you should try to flank, right? Nope. O-Ho is too slow for that (most of time). So...if you cant flank, you load gold, right? Thats the problem. 10 cm gun has NO gold ammo. This means that if you get into tier 10s...what you do against an E100? Or Maus? Jageru? T110E3? E5? Type 5 Heavy? Even against some tier 10 meds the pen can struggle. And you cant flank, and you cant load gold. This is why, in my opinion, this gun is not that good. It would be good if O-Ho had prefential matchmaking (its actually more or less KV-5 gun that fires gold as standard), but O-Ho doesnt have, which is why i consider the gun unviable choice if you want constinent results, unless you play O-Ho exclusively on tier 8 formats (and honestly, those are often fast paced with T-54 Ltwts and IS-3 often with gold loaded...exactly where O-Ho is NOT good). You could say first that its meh gun at tier 8. Tier 6's derp at tier 8 doesnt sound like a good thing at first, doesnt it? Expect... This is the key what makes O-Ho so much fun. This is the key thing what makes O-Ho my favorite tank in the game. The derp gun. Why? I already mentioned it on pros and cons: the reload speed. When O-I reloads in about 23 seconds with rammer and 100% crew, you can get it down to whopping 14 seconds with 100% crew and gun rammer on O-Ho, 13,5 if you have crew skills, all equipment, and foods! And thats not where good things ends. The accuracy and aim time are significantly improved, but the dispersion on move-values are improved too. And, at top of the cake, O-Ho can mount vertical stabilizer! Combine this with low top speed...and you have absolutely ridiculous gun handling. Given the fact you literally only need to hit the target to do damage, you can literally just autoaim at tank and just click and still have very high chance of hitting it when its less than 250 metres away. Even hitting targets from long distance when you are moving is not impossible at all. This makes O-Ho fantastic at snapshotting, which reduces exposure time significantly. With high HP and armor, O-Ho can rack up damage surprisingly well with derp gun. Well, O-Ho doesnt seem like that it has to hurry into battle. Mobility is weakness, and it will be always your curse. Although, i dont mind slow tanks at all (i have 700 battles with TOG...enough said?). You need to predict where the battle will be biggest, and go there, or you wont do much. Now we're talking! Also a reason why O-Ho is so slow and heavy. Frontal armor is awesome at 200mm, even if it is somewhat flat. It doesnt even have real weakspots either. When angled, it can reliably bounce all tier 8 heavy guns expect T34 and might struggle against Löwe and AMX 50 100 from close. When ”overangled”, it can even bounce tier 10s. Rear is best in its class/tier and side is improved from earlier Japanese heavies. Turret is very good too: the sloped parts on front bounces tier 10 reliably, and with turret being 200 everywhere, it doesnt matter too much if you are aiming away from your opponent. Side is somewhat weak however. Its 105mm and very flat. However, armor behind tracks is only 70mm thick, so be careful. Side also has huge ammorack inside it, so you should protect it at all costs. Rear is 150mm thick. Its not as troll as O-I's rear armor, but it can be still useful against some tier 6s and weak stock guns of mediums and lights. Other than, its not that good. Turret armor is 200mm all around. 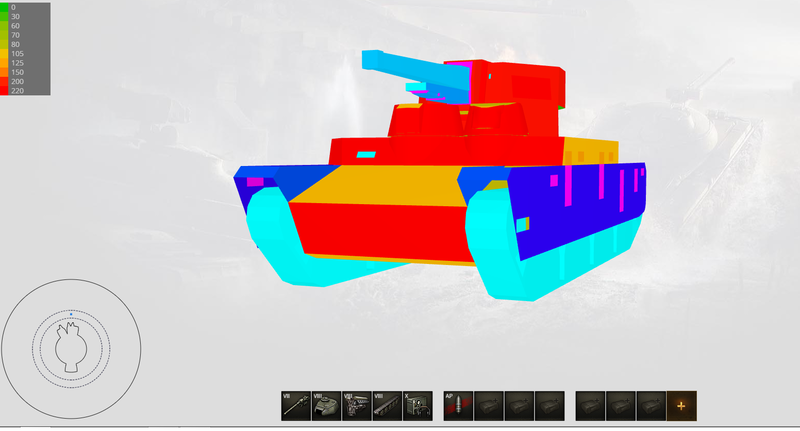 Turret face is 200mm and completely flat, which makes it arguably weakest part of O-Ho's front, but turret cheeks are not that wide and aiming there risks into hitting sloped parts of turret front, which is basically immune against every gun in the game (when facing directly towards enemy) apart from MAYBE some tier TD 10 gold shells. Mantle is solid, but it doesnt look as tough as it would be. View range is 380 metres. Not as high tier-for-tier as earlier Japanese heavies but still one of the highest in its class/tier. Big advantage over IS-3's 350 metres. HP is 1700, which allows O-Ho to be very bulky when combined with the armor it has. Even when enemy has enough penetration to go through O-Ho's armor, O-Ho can tank several hits thanks to its health. Camo is just...terrible. 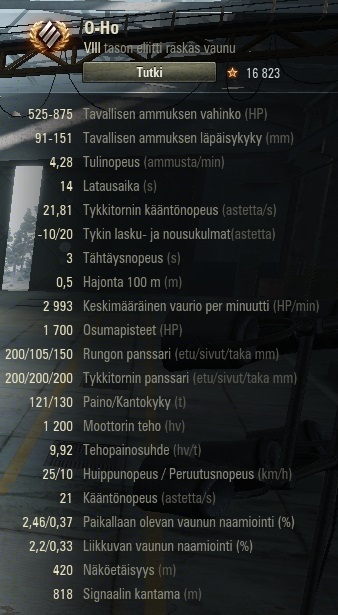 Gun depression is great at -10 but above miniturrets its only between -1 and -5, depending on what gun you use and where you point your gun. And lastly, radio range is average. Gun rammer and vertical stabilizers are must on O-Ho. Rammer for obvious reason: to make reload faster. Vertical stabilizer is also must to increase snapshotting potential and reduce dispersion when moving, which reduces exposure time. 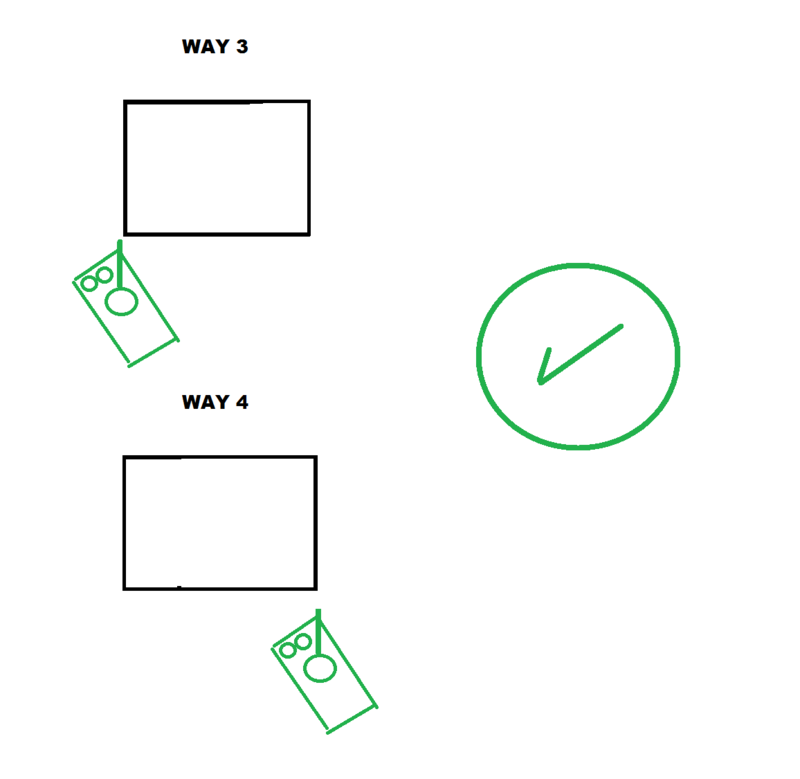 There is many viable options for last slot. Vents is most versatile equipment, further increasing gun stats and also increasing view range. Coated optics, believe or not, is actually also great option. With it O-Ho can partially negate its camo disadvantage by having great view range. Especially with good crew O-Ho can reach actually very high view ranges; sometimes able to outspot stuff it normally shouldnt! If you plan on to 3 mark O-Ho, Optics is best choice. Spall liner decreases crew death and increases resistance against arties. It can also help against opposing O-Hos. Other viable although not as great choices: GLD, Wet ammorack and Binoculars. Gun laying drive is okay for decreasing aiming time. Wet ammorack can help with ammorack, although it is often better to leave it for better equipment. Binoculars is okay option when you dont have very good crew skills but you want to have high view range. I originally used spall liner at last slot, but then vents proved to be more useful so i used it (see the picture above). When i decided to 3 mark O-Ho, i swapped vents into optics. Im happy with the decision, because having very high view range is much more helpful than one would think. Sixth sense is must even though you will be spotted often. It really helps to know when to get into cover, because arty is your number one enemy. Repairs are also important for obvious reasons. Situnational awareness and recon are helpful as like said earlier, high view range can somehow help O-Ho with vision games since how terrible camo it has. Talking about camo, do NOT train camo skill for O-Ho unless you have so good crew that you are about to run out of other good skills. It wont be...that helpful. Safe storage helps with ammorack issues. Snapshot and smooth drive further improves gun handling. And BiA is good for 3rd skill to increase little bit of everything. Note: I will mostly focus on derp gun. O-Ho has rather unique playstyle as ”defensive support bunker”. Three main rules when playing O-Ho: Dont go alone, avoid open places when possible and dont play too aggressively. O-Ho that is left out alone can be easy target if it is against more than one enemy at same time. O-Ho is massive and has no camo values, so going into open can mean very fast and cheap ticket back to garage as arties will focus on you alot. And dont play too aggressively, unless you have lots of support behind and you know they WILL support you. Too aggressive play can be punished easily because O-Ho's gun depression, which is severely limited on front. The gun depression is most frustating part about O-Ho. To use O-Ho effectively, you must learn how to use the gun depression effectively. You can see that gun's depression is limited on front. Since armor is heaviest on front, you would want to fight with front, right? At first this feels like impossible task. Miniturrets are not actually symmetrical: they are located on more left than on right. This is why you should always fight with your right side. If you fight with your left side, you will be often screwed. To make gun depression -10 degrees, you have to turn your tank too much so its side becomes easily penetratable. This is not the case when fighting with right side. Pic 3 is best way to come out. When possible, try to pic a cover where you can come out like this. Pic 4 is not bad way either, however. You do have hullcheeks, however. Thankfully they are actually as thick as front unlike on O-Ni and Type 4/5 Heavies, but still, they have ammorack behind them, so be careful. Pic 3 is also best style to angle your armor. Angled front can be actually very tough, and since almost no side is exposed your only spots with ~210mm effective armor are turret cheeks and sides of miniturrets. With moving quickly forwards and rearwards you can make opponents easily to hit your turret sides which have 350+ effective armor. Excellent dispersion values and the fact you only need to just hit your target means that you need to stop for only little moment to aim and shoot. O-Ho's gun is located on very high. With -10 degree depression, hulldowning is effective. HOWEVER, you cannot hulldown with your front. You have to go somewhat sideways to effectively hulldown. Thankfully, your gun is located very high and turret is pretty tall so you can potentially hide your hull and shot only top part of your turret, and still having possibility to shoot your opponent. You need enough big ridge however where you can hide your big fat hull. Again, excellent dispersion values means that you dont need to expose your tank for long. longer as effective. Stay at second line, come out from corner when they are reloading or not focusing you, and shoot them and try to destroy their tracks so your allies can help you. I already mentioned it is important to NEVER go alone anywhere. O-Ho is slow and massive, so it is easily flanked. Combined with weak side armor, you are basically dead if you get flanked by two or more tanks unless you can oneshot all of them. However, low profile light tank trolling big heavy is pretty classic, but it never has been as easy as with Japanese heavies. O-Ho is no expection. When light, or even medium tank gets on your side, you are in big trouble. Your hope however isnt completely lost when this happens. Try to reverse as fast as possible into closest building or whatever kind of obstacle. Try to get that pesky sidehugger between you and obstacle. This way you might be able to shoot it (and often oneshot it or deal heavy damage as light and medium tanks generally have enough weak side to be pennable by HE) or atleast be able to reverse enough to get it off from your side. 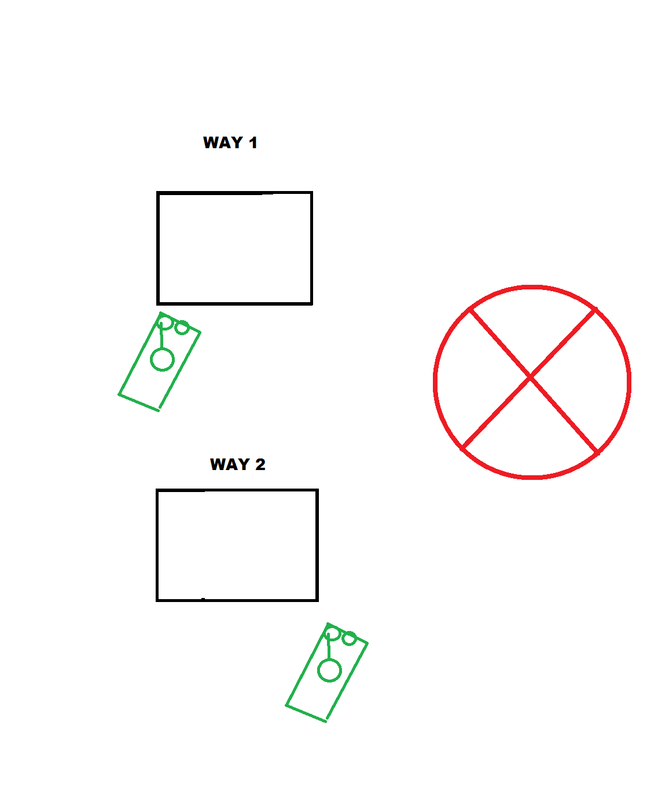 This is also why you should avoid open places, because this isnt possible to do in open places without obstacles. Your only hope is that your allies kills it or maybe even enemy artillery accidently teamkills or tracks it. Put HE as primarly ammo, because that is ammo you will be shooting more than 95% of time. HE is bread and butter on O-Ho. It deals damage to basically every tank in the game. You can do 100 – 300 even on Maus! And, lets not forget that those satisfying HE pens are still possible! Penning light tank, Waffenträger, or butts of many tanks with HE always makes you giggle like school girl, right? While you can just point into tank and shoot when using HE, there is ways to make it deal more damage. Shooting at turret face actually splashes into hull roof, which can deal more damage. Generally, when possible, try to shoot at roofs of tanks. HE splash often destroys (sometimes both) tracks, which makes O-Ho useful at slowing enemies down. HE also causes lots of module damage, and with O-Ho's rate of fire, your opponent's amount of module damage will look pretty ugly. While HE is definely most important ammo for O-Ho, AP and HEAT can be useful in some niche situations. There is only and one purpose for AP: for overmatching. Unlike on O-I it is too weak to shoot it anywhere else than turret or hull roofs. Even then, its very high risk but also very high reward. However, when you master at using AP, risk becomes lower. 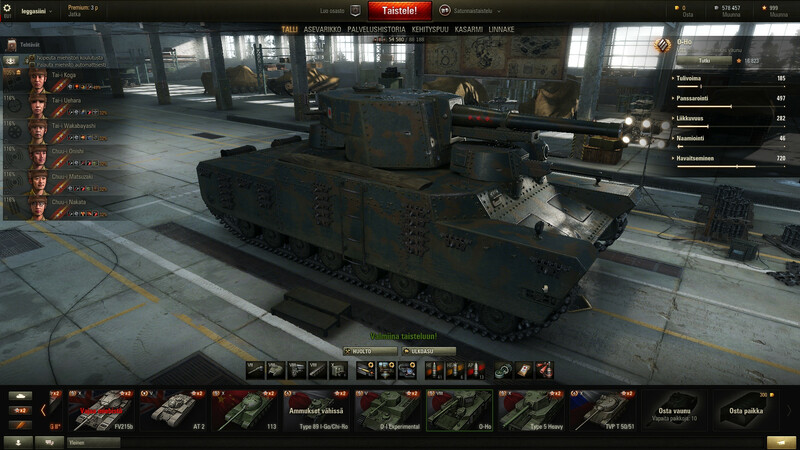 You can overmatch 49mm and lower turret and hull roofs. This means that you can blast IS-3's or IS-6's turret roof for 700 damage! You need to be very careful however: your depression is poor on front so facehugging can be tricky. When doing this, you should turn your tank when you are about to shoot so you can depress your gun down. It is better to wait for your enemy to shoot into your front rather than into your side. Aim very very carefully, because one miss or bounce can cost your life. AP can also pen some butts of tanks that HE cant, such as Tiger I/II's, but this is better left out for HEAT which has better raw penetration. HEAT is premium ammo, but unfortunately has only 150mm penetration. You could first ask why i would use AP with same damage but 30mm less penetration? HEAT cant overmatch. It can be useful for bullying lower tier heavies that are not pennable by HE, or butts of some tanks that HE cannot pen. However, DONT SPAM HEAT. Sadly its not like SU-152's HEAT. That would be at same time gloriously disgusting and hilarous. http://wotreplays.co...leggasiini-o-ho - replay where i got my 2nd mark, 5k damage. Shows how monstrous O-Ho can be in dream matchup. http://wotreplays.co...leggasiini-o-ho – this replay shows how hilarous moments you can have with O-Ho, this being most ultimate example. I will add up more replays soon. I love O-Ho. It is no doubt my favorite tank in the game. When im having a bad day on WoT, playing O-Ho almost always makes me happier. And one last thing: TRY PLATOON WITH 3 O-HOS WITH DERP GUNS! ITS ABSOLUTELY HILAROUS! You can just basically permatrack stuff like IS-7 from full HP until it dies. Oh and O-Ho makes credits really well, in fact when it comes to earnings it earns by far best out of all regular tier 8s i have. Maybe because 1) it survives often 2) it has very cheap ammo 3) i almost never fire gold on it. Currently on the O-Ni. Looking forward to O-Ho-Ho-Hoing. In theory, yes: that tiny orange bit on the left tumor. Thats exactly why i love derp gun. I'm rather looking forward to the O-Ho mostly just to not have to be in the damn O-Ni anymore. I still havent three marked it and it is slowly killing me. Also at least with the O-Ni and I imagine it applies to the O-Ho there are some positions which you can get shots on that you can't in normal tanks. On Serene Coast for instance in F9 you can get shots over the ridge while on the flat ground into the people in the center and town area (normally either right at the start of after the battle in the south is done). Also there are a lot of hills with the O-Ni that you can get good depression on your left that I imagine would apply to the O-Ho. Also there are a lot of times you can shoot the ground underneath a tank to do more damage but that can be sort of tough because of the height of the tanks. So much this. A long long time ago in a server far far away (US East) there was a lone T29 hulldown on a hill. There were 8 of us on that flank. All of us immediately switched to HE and killed that T29 in half a minute. Was glorious. and added few things. Will update my stat picture but wont login into tanks today anymore only to do that, so tomorrow.